Like most people I’ve read about recently, I collected baseball cards as a kid, stopped at some point for whatever reason(s), and started up collecting again in the last year or two. 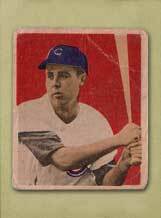 What started my resurgence into the hobby was an inane idea sparked by my all-consuming love of all things Mets. Somehow the idea formed in my brain that I wanted to collect every Mets card ever made. So I began researching every checklist site I could find and kept looking and kept looking, and began to realize how many Mets cards are actually out there. I think at this point I have a fairly comprehensive list, and I feel like I’ve put at least a little dent into it. I think at this point I have at least 1 card from every year. Thats a start, right? 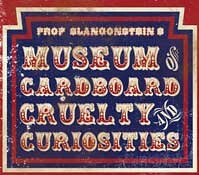 Anyway, the point behind this blog is so I can relate my experiences/opinions on trying to navigate the wacky world of card collecting while at the same time trying to lead a semi-normal adult life, which basically translates to trying to acquire baseball cards without breaking the bank. 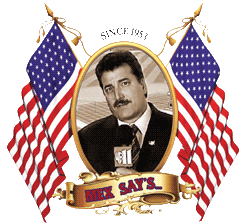 After all, although I would love to get that dead-mint Seaver rookie card to round out my ’67 Mets set, what would I tell the wife? 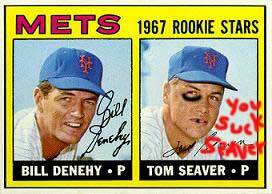 I guess that means I’ll have to settle for the Seaver rookie that some kid decided to black out his teeth because he was pissed after Tom threw a particularly horrid stinker back in the day. And maybe after that, he stuck Tom in his bike spokes for a few spins around the block. 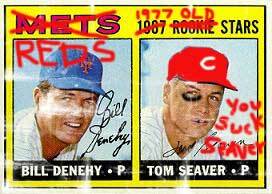 Years later, after kid A traded Tom to his friends younger brother for 2 marbles and a Oscar Gamble Traded afro card, Little Brother dutifully updated the cards with red pen to reflect Tom being unceremoniously sent to the Reds in 1977. Oh, what must Bill Denehy have been thinking? He didn’t sign on for all this when he agreed to share cardboard with that damn Seaver kid. 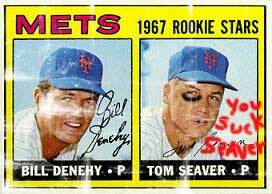 I guess that particular Seaver rookie might still be a little too expensive for my collection, but that would be the type of card I would get.